Musical Aberchirder panto singer graduates with performance qualification – oh yes she did! Talitha Brown,20, graduated yesterday from NESCol with a HND in Acting and Performance. Growing up within a musical family in Aberchirder, it is not surprising that 20-year-old Talitha Brown now has her sights set on a star-studded future. 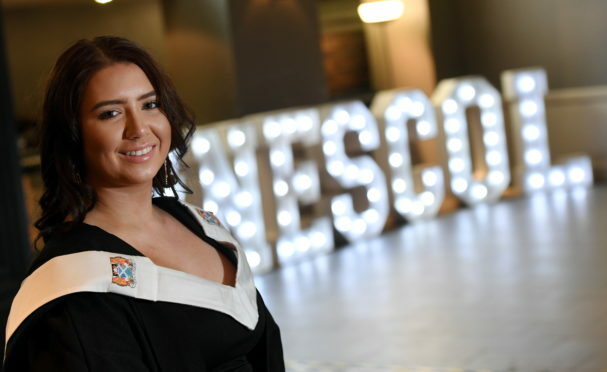 Graduating yesterday with a HND in Acting and Performance, former Banff Academy pupil Miss Brown said she had always harboured an interest in music. She said: “My mum used to be in musicals, and my gran was too. My dad plays the guitar in a band, and so do my brothers – so it’s in my blood. “I have always loved performing and I have appeared in quite a few musicals and shows now. I think my favourite one has been We Will Rock You. “My latest part is one of the good witches in the Wizard of Oz panto, which will be on in Huntly later this month.